Learn about traditional thick Greek coffee, aromatic (and therapeutic) herbal teas, and the wide selection of Greek aperitifs, wines, and spirits. Greece’s favorite anise flavored drink is potent and fiery and distinctly Greek. 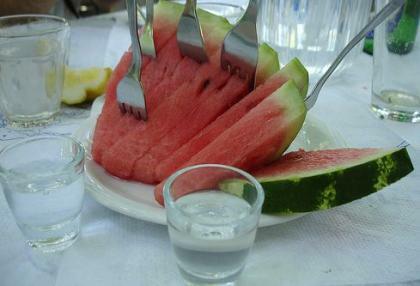 More than just an aperitif, ouzo is a social phenomenon and a cultural mainstay of Greece. Pine wine? Check out an acquired taste that Greece for Visitors Guide, deTraci Regula, did, indeed, acquire. Different from the “raki” made in Turkey and other places, this distilled liquid fire from Crete is general drunk as an after-meal liqueur from very small glasses. Learn how it’s made and about it’s history from Sfakia-Crete.com. Camomile (or chamomile) is a favorite in Greece where it grows abundantly and is gathered in the wild. Greek mountain tea is credited with a wide range of health benefits, and most Greek homes have a supply on hand. Made from the medicinal Sideritis plant, Greeks believe that a cup a day has infinitely more benefits than an apple. Frappé is so popular in Greece that many homes have soda fountain-type drink mixers in order to make it even easier. Here’s how to make this version of iced coffee by hand. Learn how to make Greek coffee in easy steps with photos. Greek coffee is brewed thick and the grounds are poured into the cup along with the coffee. These steps will help you make the perfect cup to serve with pastries and desserts, or simply with a glass of cold water. Ariani is a direct legacy from the Turkish Ayran, and is especially popular in the Greek regions of Evros and Thrace, which have large populations of Greeks of Turkish descent. It’s an acquired taste, but very refreshing once you get used to it. Non-alcoholic, it’s reputed to be a great hangover cure. The Sorrento region of Italy is best known for this liqueur, but the Greek version is equally delightful, with its own character. A treat on a hot day, this non-alcoholic drink is made with sour cherry syrup.